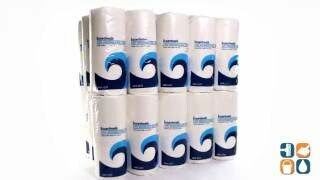 Boardwalk designed these paper towels to provide strength and absorbency for general household cleaning tasks. These quality paper towel rolls are a great economical alternative to more expensive name brand roll towels. Boardwalk 2-ply perforated towels are ideal for use in any home or business. Environmentally safe, while still providing softness and absorbency, Boardwalk paper towels are made from 100% recycled materials. Each Carton comes with 30 rolls of paper towels, so you can stock up and still stick to your budget. CleanItSupply.com - the wholesale paper supply company buyers trust. Excellent, affordable towels. Not fancy. Used in the kitchen and for house cleaning. Recommended for home use for everyone on a budget. I love the variety offered and this item is wonderful quality. Thin enough to wipe hands and kitchen areas quickly. The size is perfect and it's so nice not having to buy paper goods at my local store several times a month. I would recommend this product for use in any office or production breakrooms. I got a good deal on these, they were marked down and saved money with my purchase from CLEANITSUPPY - These paper towels work fine, I'm glad I bought them!